While the decision was almost immediately rescinded amid an outcry, the commission appeared to continue to vacillate. Local unionist MP David Simpson said he was told at a meeting with the newly-appointed commission that the march remains “under review”. Nationalists living on the Garvaghy Road have called on the PSNI to enforce the decision amid fears that an attempt to hold an inflammatory sectarian march by the “back door” will go ahead regardless this Saturday, June 28th. Attempts by the anti-Catholic Orange Order to march through the Catholic enclave every July in the late 1990s saw conflagrations which often reached across the north of Ireland, and were linked to a number of loyalist killings at that time. The tensions were only defused in 1998 when the parade from Drumcree church began to be consistently rerouted away from the nationalist area. 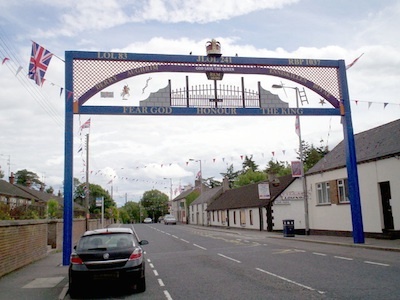 Members of the Orange Order are now seeking to walk along a section of the lower Garvaghy Road to mark the “dedication and unfurling” of a refurbished ‘Orange Arch’, a structure constructed over the thoroughfare and their largest official emblem of the marching season. After initially being given the go-ahead, the Parades Commission did a U-turn and eventually banned the sectarian display -- but there are fears the PSNI may still turn a blind eye, despite a recent court judgment requiring them to enforce such parade decisions. Garvaghy Road Residents’ Coalition spokesman Breandan MacCionnaith said local people would be monitoring the situation. “We said to people at a public meeting if the review decision stands people should not go towards the interface area at all,” he said. “They should go and watch the Armagh match on TV. Adding to local concerns is the fact that many foreign nationals live in the interface area at the bottom of the Garvaghy Road known as Victoria Terrace. Threats to foreign workers, particularly to the North’s largely Catholic Polish community, have been a significant feature of this year’s marching season. Polish flags have appeared on loyalist bonfires and two Polish men suffered a racist attack close to a loyalist bonfire site in Lisburn last weekend. The bonfires are due to be set ablaze on July 11th, the eve of the height of the marching season the ‘Twelfth’, which commemorates a famous 17th century Protestant battle victory over Catholics. Loyalist flags glorifying the ultra-right British National Party and the openly racist English MP Enoch Powell have also begun appearing in west Belfast. One such flag, which carries the words “Enoch Powell was right” was put up close to one bonfire site. The flag is understood to be a reference to Powell’s infamous ‘rivers of blood’ speech warning of racial conflict. Elsewhere, intimidatory flags have begun appearing outside Catholic churches in County Antrim. Tensions are also building in north Belfast after a nationalist residents group said it had been excluded from dialogue organised by local churchmen to deal with loyalist demands for an Orange parade on the Twelfth through the nationalist areas of Ardoyne, Mountainview and The Dales. Announcing multi-party talks due to begin at Stormont on Wednesday, British Direct Ruler Theresa Villiers said she was most concerned at the situation in north Belfast which she said was “volatile”. She said the ongoing loyalist ‘protest camp’ at the interface with the Twaddell Road had made things “extremely difficult”. All sides should accept the decision of the Parades Commission regarding this year’s parade, she said: “The crucial thing is that whatever their determination is that it is respected”. Nationalist residents spokesman Dee Fennell said attempts to exclude his more hardline Greater Ardoyne Residents Collective (GARC) from talks to resolve the dispute were “disappointing and unhelpful”. Pointing to loyalist calls for all stakeholders to be included in the talks, he said that it was not “appropriate to exclude a legitimate residents’ group in the area from any process that would hopefully end sectarian parades through this area”.